The Oregon Student Alliance for Equal Rights has four tables to be manned on this Thursday, the 20th, UO move-in day. The person in charge, Andreiana suggested being at the EMU at 7:30am, room 4, to get T-shirts, and materials. They are also going to be using clip boards to circulate among the crowds. A couple of us will be there. Not sure of the total time commitment. Join in, if you can. Have you planned your weekend? If neither of these events match your interests or schedule, check the DPLC calendar for Heather Buch canvass events on Saturday and Sunday plus phonebanks Monday through Wednesday.. Looking ahead, we’re asking NOW members to plan a houseparty or other method for reaching at least 5 additional voters before of September 29th to encourage them to be sure to vote against Measures 103, 104, 105, and 106. And please mention our support for Governor Brown during those conversations. Please join Planned Parenthood Advocates of Oregon and 48 other organizations across the state in a Day of Action to oppose Ballot Measure 106. No Cuts to Care is kicking off its campaign to defend reproductive freedom in Oregon with events in Portland, Eugene, Salem, Hillsboro and Clackamas County. Click here to sign up for the No Cuts to Care Day of Action on Saturday, September 22nd! 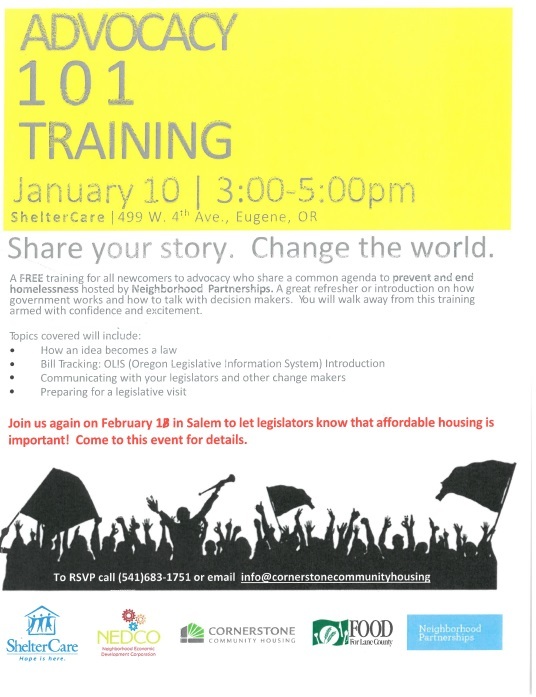 NOW members in Eugene: are you ready to become a participant in government? The City of Eugene is looking for citizens to take roles in city Boards and Commissions. Here's the flyer. Applications are due by March 31st. The ACLU announcement notes that this is a rare opportunity to engage publicly with the DA, a chance to let local justice officials know that people care about criminal justice reform. More details and link for RSVP at this site. Reyna Lopez of Family Forward has organized a web-based training session for NOW members. 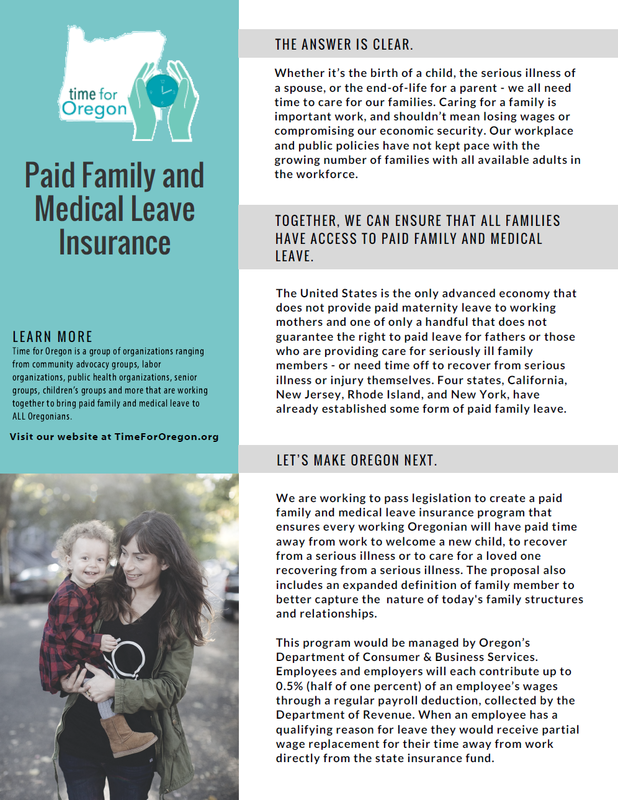 The objective of the training is to enhance members' skills in advocating for the Paid Family and Medical Insurance bill that will soon be before the Oregon legislature. This educational session will be held on January 9th from 7-8:30p. PLEASE REGISTER USING THIS LINK TO RECEIVE THE WEBINAR LINK. One tip: if you haven't used google hangouts before, allow up to half an hour to get this software up and running on your machine, be it PC, tablet, or telephone. What a whirl-wind of actions for justice! Besides the Yes on 101 rally Sunday [Dec 3rd], 350 Eugene is having a rally at REI as part of a wider effort to get the corporation to stop working with financial institutions that have clients working with the fossil fuel industry. There is an on-line petition if you go to the 350 Eugene page. Also Sunday, an excellent presentation by a noted forester about proper forest management, sponsored by the Many Rivers Sierra Club. Tuesday is the Noon Tuesday rally hosted by Indivisible and Take Action Eugene. Got an email from an ACLU People Power leader just moments ago about a Tuesday action ALCU is proposing regarding the Supreme Court "cake case". Perhaps Noon Tuesday will focus on this issue. Each week it varies. Thursday, December 7, Our Revolution Lane County has organized a demonstration outside the Coburg Verizon store in support of net neutrality. This is also on the facebook pages. That evening is another excellent film at the Bijou on 13th, hosted by Encircle Films. Always sold out. So get tickets ahead. Highly recommended. Planning to attend Saturday, December 9, at a Health Care for Oregon seminar regarding Yes on 101 and how to effectively communicate about the issue. Let me know if you would like particulars. It may be on their websites. Monday, December 11 is another Eugene City Council meeting. 350 Eugene will be continuing to emphasize the importance of an ordinance to stand with the Thin Green Line being formed along the west coast to prohibit fossil fuel transportation to China. Thursday, December 14, is Friends of Sanctuary monthly meeting. I and another will be presenting information about the Gorge ICE Resistance and how we might be helpful. Will be tabling for 350 Eugene at the Holiday Market at the fairgrounds December 17, providing information about why it is important to stop the Jordan Cove LNG pipeline. As the new academic year starts, we have the opportunity to review recent accomplishments in the legislature and get involved in planning for the upcoming short session in 2018. Here are several places to look for more information. Please look beyond the Ceasefire event, which is first because of time-criticality, to find links to one recorded forum and one report. 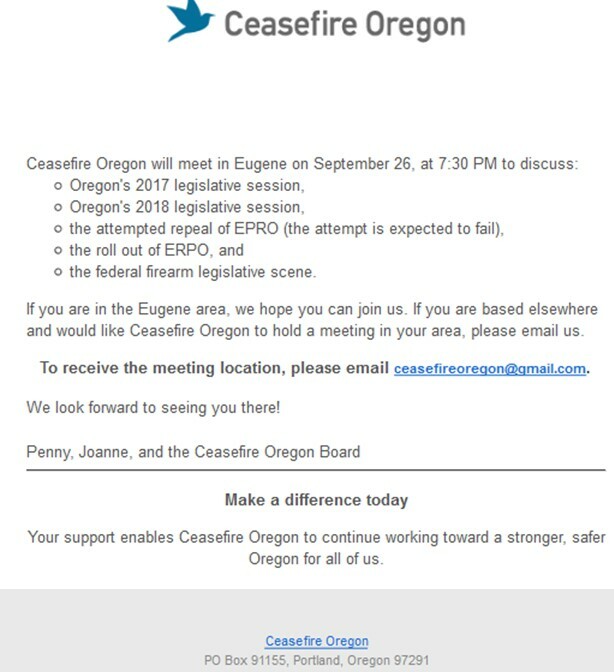 On September 26th, Ceasefire will host a discussion of the current status of firearms legislation in Oregon and at the federal level. Location is local in Eugene, but you will need to email Ceasefire for location details. A recording of the forum held on September 15th is available on facebook at this location. Representatives from the legislature, including our local representative Julie Fahey, and from organizations fighting for all aspects of women's rights, participate in a wide-ranging discussion of past legislative accomplishments and future objectives. And you can find the latest edition of the Oregon League of Women's Voters Legislative Report (September 2017) here.